On Monday, March 24, kids and families from Mr. Laurie's grade 5 class at École John Stubbs Memorial School filled Colwood Council chambers for the presentation of a Pay it Forward award for their colossal efforts in counting blossoms for the Victoria Flower Count. 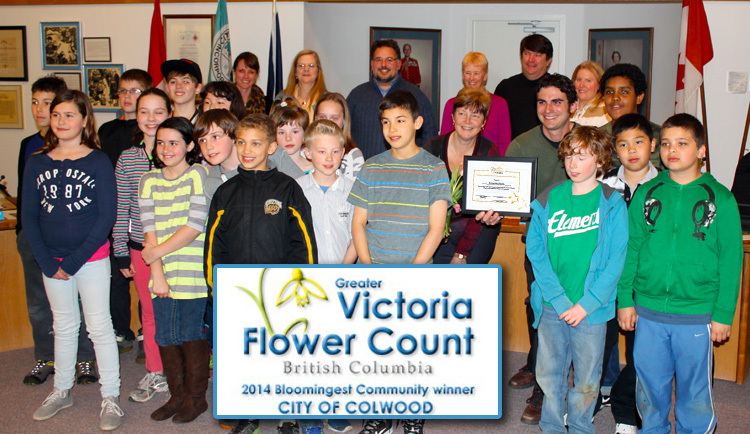 Their work helped Colwood earn the title of the Bloomingest Community in Victoria! The students went above and beyond, counting blooms around Hatley Gardens at Royal Roads University, encouraging friends and family to add their flower counts, and keeping spreadsheets to track their progress. “The annual flower count is fantastic way to highlight the beautiful setting we live in. Colwood residents love their gardens, and we’re fortunate to be home to many beautiful parks, including Hatley Gardens,” said Colwood Mayor Carol Hamilton. “Thanks to everyone who boasted about their blossoms this year – especially our young students at École John Stubbs for taking pride in their community. What a wonderful way to welcome Spring!" Ayla MacDonald is one of the grade 5 students who participated. Reflecting on the award presentation after the meeting, she commented to her father, "That was fun! Who were those people again?" Her father, Scott, explained that they were the mayor and councillors and that they were in charge of making sure things got done in Colwood. Ayla's response: "Oh, then they should make sure there are more flowers next year!" Challenge accepted. Mr. Bell also attended the March Council Meeting to present Mayor Hamilton with the 'Bloomingest Community' certificate and to congratulate the John Stubbs students.